This may not be what you had in mind when you saw the title above – but it’s beautiful!! Sara is very good with color – something I can’t claim to be. I always enjoy her color combinations as well as neat stitches and attention to detail. Further, I appreciate that she crocheted this potholder in wool rather than acrylic. Even if it’s purely decorative, I hate to see potholders and hotpads made with acrylic. If you’ve ever gotten an acrylic burn, you’ll know why. Wool and cotton make much better sense to me. 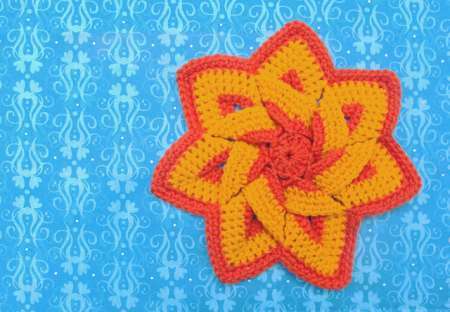 where you can also see a few other samples of her floral potholder. Pretty!